One of the areas Christians often struggle with has to do with trusting God’s hand in every situation. When things do not happen the way we want them to, we immediately assume that God is silent. But the Bible assures us that God is in complete control of everything. 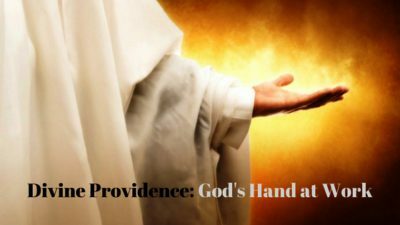 In theology, this doctrine is called “Divine Providence.” It is the means by which God directs all things – seen and unseen, good and evil, animate and inanimate – toward a worthy purpose. We may not always understand the reason behind every event that transpires in the world and in our lives personally and individually, but God wants us to trust Him because He always works things out for our good. The verse says, “all things,” which means ALL things – whether good or bad. It may seem to us like evil is tearing the world apart, but if we look at it from God’s perspective, we realize that it is actually playing a secondary role for God to carry out His greater purpose. God allows things for a reason and His plan is always good. The Joseph Narrative contained in Genesis chapters 37 and 39-50 is one of the best illustrations of God’s providence. When we read through these chapters, we see that Joseph is the central human character at nearly every point. Who is Joseph? And how did God use every detail in his life to fulfill His plan? Joseph was the 11th among the 12 sons of Jacob, he was the first son of Jacob with Rachel, he had a younger brother named Benjamin and he was Jacob’s favorite and most loved among all his sons. Out of hatred, Joseph’s brothers conspired to kill him when he followed them to Shechem and into Dothan pasturing their flocks (Genesis 37:18-20). They hated Joseph for three reasons: 1) he reported to his father the bad things that they were doing (Genesis 37:2), 2) he was their father’s favorite son and made him a coat of many colors (Genesis 37:3-4), and 3) he told them his dreams of arrogant superiority (Genesis 37:6-8, 9-10). But God used Reuben, their eldest brother, to deliver him out of their hands (Genesis 37:21-22). Eventually, they sold him to the Ishmaelite traders for 20 shekels of silver (Genesis 37:28), who in turn sold him in Egypt to Potiphar, an officer of Pharaoh and captain of the guard (Genesis 37:36). While in Egypt, Joseph worked for his master Potiphar and became a successful administrator. Why? Was it because he was smart and possessed extraordinary administrative skills? Not really! The Bible clearly identifies the reason. Joseph succeeded in everything he did because the Lord was with him … the Lord was with Joseph (Genesis 39:2-3) and for Joseph’s sake, the Lord blessed Potiphar’s household and all that he had (Genesis 39:5). Unfairly jailed, Joseph rose to inmate administrator (Genesis 39:19-20). Why? Again, the Bible leaves no doubt as to who is responsible for Joseph’s success. The Lord was with Joseph in the prison; He showed him mercy and gave him favor in the sight of the warden, who put him in charge of all the other prisoners and everything that happened in the prison (Genesis 39:21-23). The inspired narrator pointed to God as the One working things out for Joseph. It’s all God. God is in complete control of everything that‘s happening in the life of Joseph. Whatever managerial skills Joseph might have had clearly played a secondary role in God’s intervention in his life. When we read that Joseph was thrown into prison, we would think that it’s the end of the narrative. But God isn’t finished yet, not by a long shot. When Pharaoh’s chief cup bearer and chief baker who were put in prison by their master each had a dream, Joseph interpreted it for them. However, the chief cup bearer who was restored to his former position as Joseph predicted forgot all about him (Genesis 40:23). Two full years had passed when Pharaoh had two dreams that no one could interpret; not even the magicians and wise men of Egypt. And that was when the chief cup bearer remembered Joseph who was still in prison. He told Pharaoh about Joseph who interpreted his and the chief baker’s dreams. Pharaoh sent for Joseph and asked for the interpretation of his two dreams, which are about the 7 years of plenty that are about to come followed by 7 years of famine. Because of the wisdom that God gave Joseph to interpret his dreams, Pharaoh made Joseph ruler over all Egypt, second in rank to him. During the 7 years of prosperity, Joseph gathered and stored an immeasurable amount of grain in Egypt. So when the 7 years of famine began, people all around the world came to Egypt to buy grain from Joseph. While in Canaan, Jacob heard that grain was available in Egypt. So he sent his sons, except Benjamin, to Egypt to buy grain. After 13 years, Joseph came face to face with his brothers once again. But they did not recognize him. After several trips to Egypt, Joseph’s brothers settled there. Their father Jacob also went to Egypt, along with all his descendants, livestock and goods, and they all settled in Goshen. The entire process of Joseph’s fall and rise to power was God’s doing. His release from prison because of his God-given interpretation skills, his exaltation to power and the opportunity to help his family during the famine all point to God’s providence. The focus in the narrative was on God, and He can accomplish what He wills. Even the evil intent of Joseph’s brothers toward him was used by God to fulfill His purpose. As he said to his brothers, “Am I in the place of God? But as for you, you meant evil against me; but God meant it for good, in order to bring about as it is this day, to save many people alive” (Genesis 50:19-20). The chain of events that took place was part of God’s bigger plan for Israel as a nation. God sent Joseph to Egypt ahead of his family in order to make way for the preservation of the Canaanites and Egyptians together with them during the time of famine. How did God get Joseph to Egypt? By allowing his brothers the freedom to sin. As it turned out, Egypt was where God built up and multiplied His people. God prepared them there for the exodus and conquest that He would use to give them the land that He promised to Abraham – the land that’s flowing with milk and honey: Canaan. God is in control of everything. In the same way that God worked in the life of Joseph, and used even his mistakes and allowed him to experience misfortunes in order to accomplish His purpose, God is also working in the life of every believer who loves Him to carry out His will. Whatever you’re going through, know that God will use them all for your own good. He can even turn the bad things into blessings for you. God called all believers for a purpose and He will accomplish it. We can make many plans but in the end, it’s the Lord’s purpose that will prevail (Proverbs 19:21). One thing I struggle with is control, it’s really hard to let go. Even though I know God has a plan and he is always good, I struggle to let go of the things in my life that worry me or otherwise consume me. When I don’t see the results that I think should happen, or what I want to have happen, yes, I feel like God is silent. It is really hard to let go and realize that He is in control and I am not. Thanks for sharing, this is a great article. I can relate with you Steve because I often find myself in the same exact situation too. We still worry a lot even after surrendering our situation to God and knowing that He’s in control and we’re not. It’s also hard for us to understand how God allows us and the people we care about to go through certain misfortunes but we just need to trust God because He knows what He’s doing. Thanks for sharing your thoughts Steve, God bless you more! I believe that God is all around us and in everything, but I also believe we have free will and that free will is choice which can be in favour of God or against God. God would never be in control of people doing things against God would he? That said, I also believe that God is always there for us, we just need to ask and be open to his involvement. Thanks for visiting. I am in complete agreement with you that God has given us freewill to either obey or disobey Him. When I said that God is in complete control of everything, I did not mean that we are not free to do whatever we want. God being in complete control of everything means nothing happens without His permission. In other words, all the things that are happening in our personal lives as individuals and in the world as a whole, happen because God allows them to happen. But that does not necessarily mean they are in line with the will of God. But for those who love the Lord and are called according to His purpose, every detail in their lives, God will use them for good. Even the bad things, God will turn them into blessings.